We are way down south and Telstra hasn’t discovered the place yet! (I think they have, but it wasn’t working while we were here.) 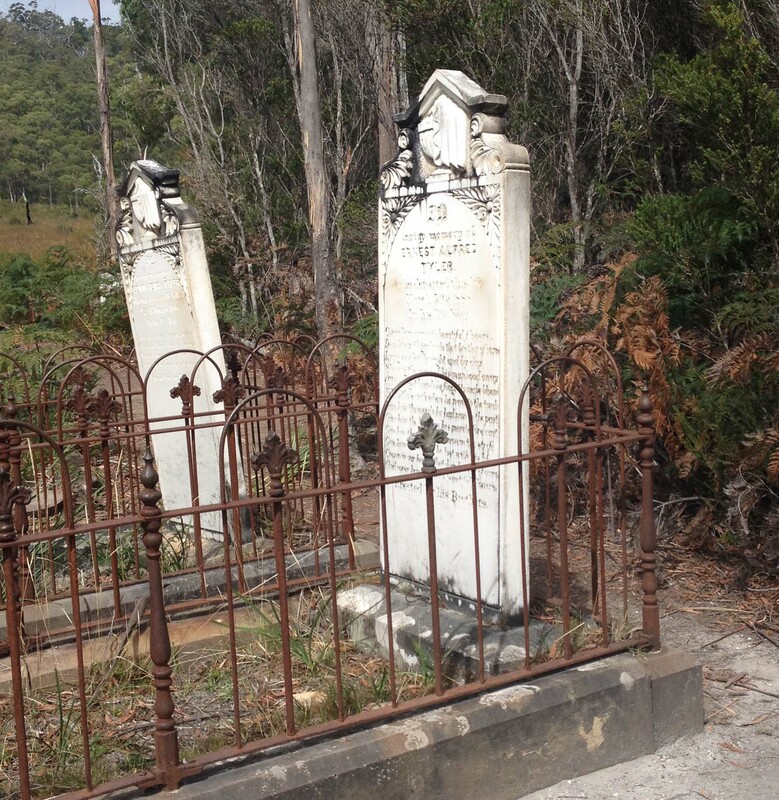 My iiNet was too slow for photos in the blog, so the blog has had to wait until the week after. While there, we went on the Ida Bay Train. 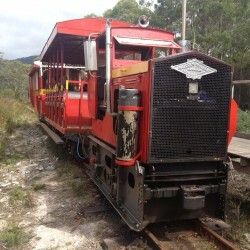 This train was used in the late 1800s, to take wood to the port, but the port wasn’t deep enough, as they had filled it with sawdust and the railway was extended to “Deep Hole”, discovering that Deep Hole had a much deeper hole in the centre of it, making it perfect for their loading of ships. The jetty was 1 Km long. With the forest becoming depleted of wood, it was fortunate that they discovered limestone, which was a far more lucrative venture. They were very lucky as the process to generate Carbide (for lighting), had just been discovered, and soon after the way to generate acetylene from limestone was also discovered. As a result limestone was in great demand. Eventually they built an acetylene plant at Southport. 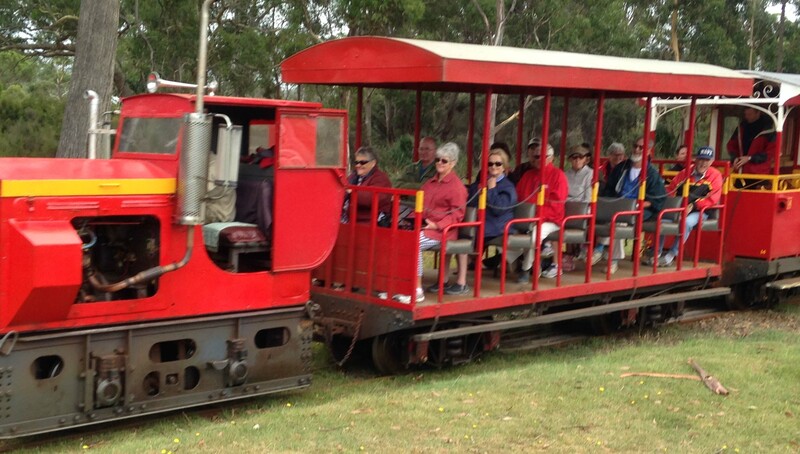 This funny, noisy little train took us through beautiful scenery, grassy plains, as well as the cemetery, where graves of two families were buried. 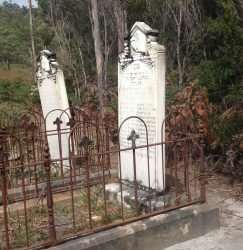 Graves of a 14 year old boy and his 19 year old brother, with headstones provided by their brothers, were there. One of the families had 22 children. We continued until the train reached its final destination, Deep Hole. We had 15 minutes or so to stretch our legs at a beautiful bay, then back to Ida Bay Station. It was a great day that everyone enjoyed. After we got to the station at 2pm, we drove into the Southern Forests and South West National Park and had a cut lunch, listening to a Lyrebird very close to us, going through his repertoire, which ended with the sound of Black Cockatoos. It was magnificent. Russ went for a walk into the forest, which was a fantastic old growth forest with lots of moss and ferns around great big trees. 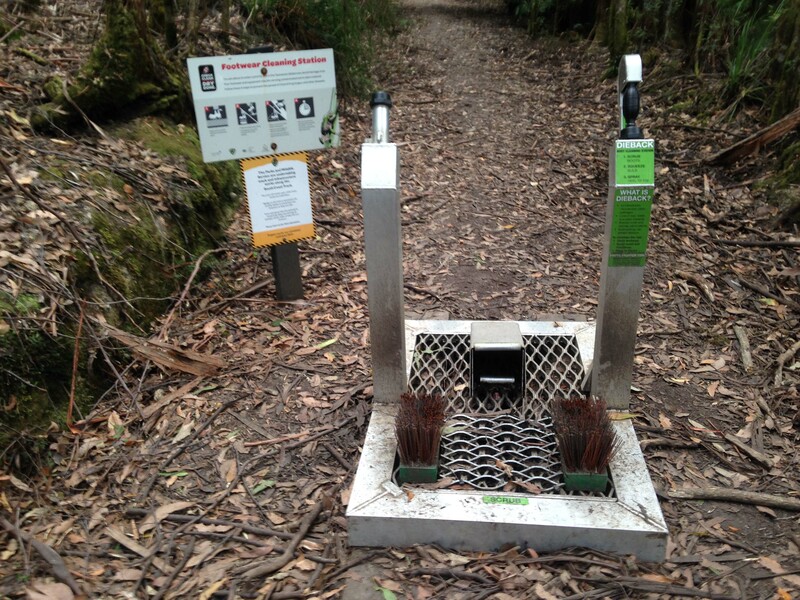 He had to scrub and flush his boots in a cleaning station set up to protect frogs from a virus. We had a counter lunch the next day at the most southern pub in the Australia. Our caravan park is in its grounds. The weather here has been amazingly warm, always in the mid to high 20s, and we have suntans. 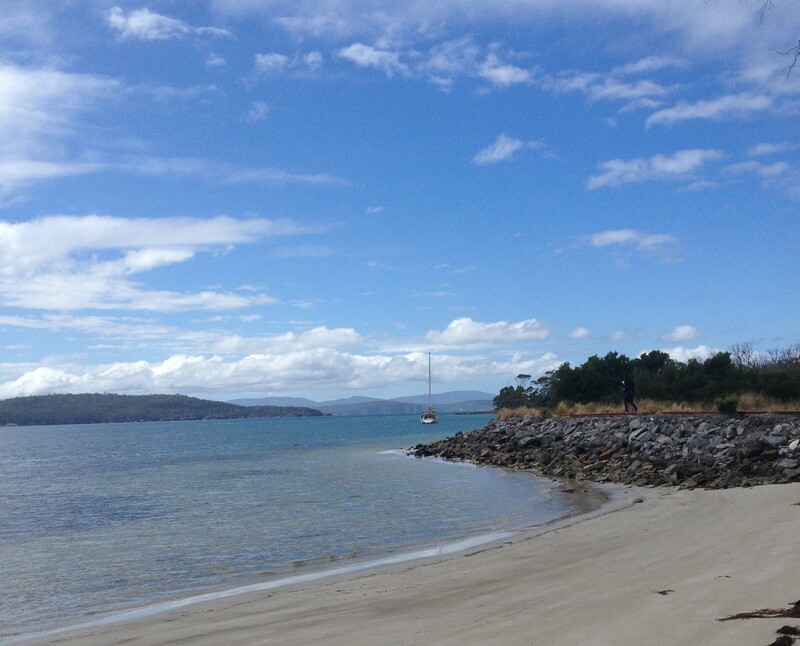 We have moved Eastward now to the Tasman Peninsula near Port Arthur and our next blog will tell you about White Beach where we are staying.